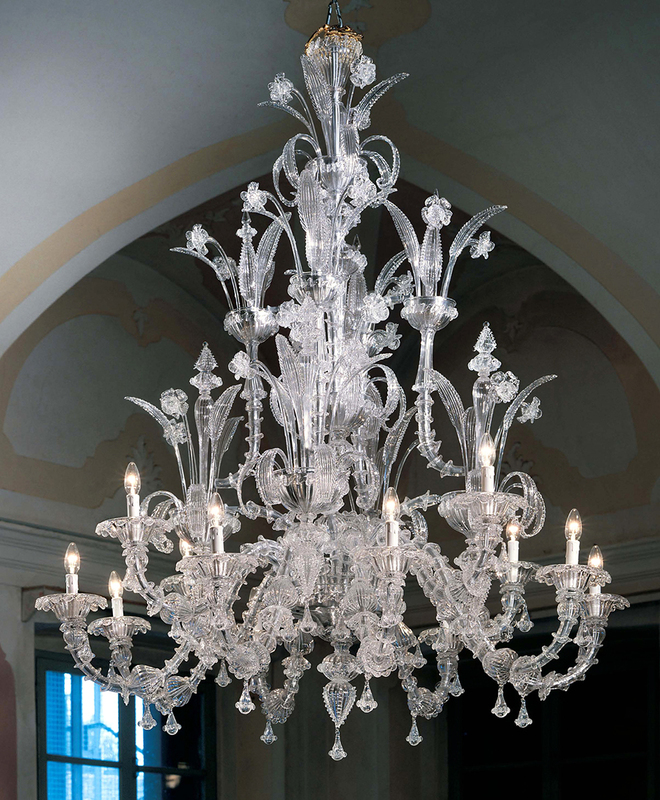 This crystal floral masterpiece is part of the Murano glass chandelier Collection. It is a large, classic chandelier. 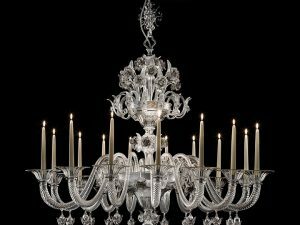 Because of its imposing size and design, this chandelier needs to preside over a large space such as a banquet hall, ballroom, or large foyer. This chandelier would also work well in an upscale professional establishment such as a spa, law office, or plastic surgery suite. 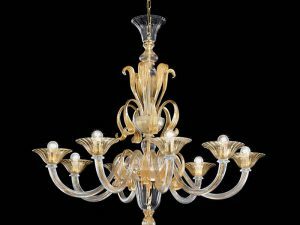 This Murano chandelier features flowers and leaves perfectly crafted in crystal clear Murano glass traditional Murano chandelier with chrome metal finish. It is the definition of success and luxury, with every detail of delicate flowers translated into glass and light. The bulb housings are situated below the glass sculpture; this allows the light to illuminate the crystals and glass flowers, which gives the chandelier the effect of glowing from within. 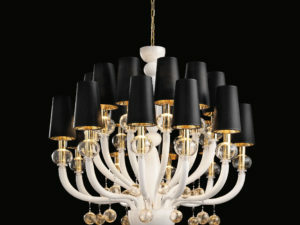 This Murano chandelier is also fully customizable. It is shown with clear glass and chrome fixtures, however, other metallic finishes ae available upon request, and the clear glass can also be colored to order to match any existing decor. Size: H. 65″ x D. 55.2″ (H. 165cm x D. 140.2cm) ask about custom size. Lead Time: 8-10 Weeks, International door to door delivery. 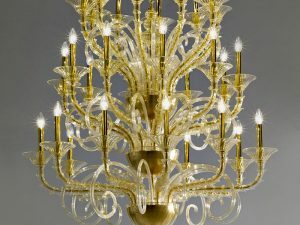 Murano chandelier available in the following colors: Gold, Milk-White + Gold, Clear glass or custom color upon your request. It is also available in larger sizes with 15 lights and 18 lights, custom Murano glass color and custom metal finishes upon your request.